﻿ The Arts Castle - Ohio. Find It Here. The construction of The Arts Castle was completed in 1854 as a private residence for George W. Campbell and his wife, Elizabeth. She was the daughter of William Little, a pioneer and founder of Delaware, who gave the couple the land on which The Castle stands as a wedding gift. The Campbells had 4 children, Frank, John, Catherine, and Bessie.The architecture is in the Romanesque Revival Style popular in the mid-19th Century. The Castle is built of blue limestone from the Blue Limestone Quarry, which was founded by Mr. Little and later owned and operated by Mr. Campbell. The quarry is now the nearby Blue Limestone Park. This distinctive stone has also been used in several other notable Delaware buildings including St. Peters Episcopal Church, also located on Winter Street. 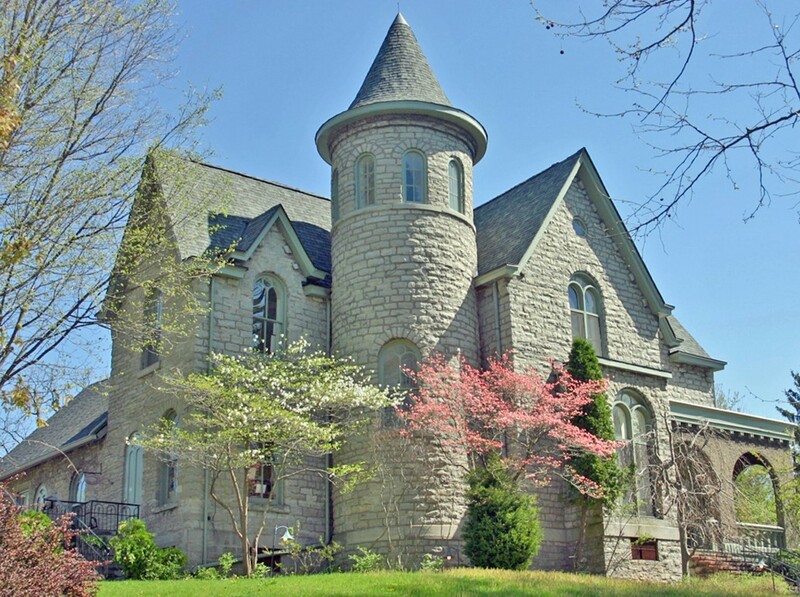 The Arts Castle was formed in 1986, and its mission continues today which is dedicated to nurturing the creative energies of the residents of Delaware County and surrounding areas by offering full access to a variety of multi-arts experiences such as classes, workshops, performances, exhibitions, and special events. Visitors can take a self-guided tour, enjoy the exhibit, and browse the gallery shop. Many make The Castle Arts Affair that occurs each November a holiday gift shopping tradition.